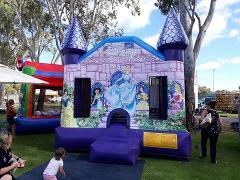 The perfect addition to your little princesses next birthday party! Featuring Snow White, Jasmin, Cinderella, Belle and Aurora. To infinity and beyond! 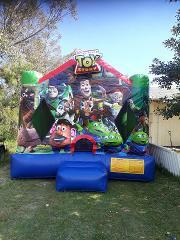 The kids can jump along with Woody, Buzz, Jessie and the gang at their next special event with this awesome castle! 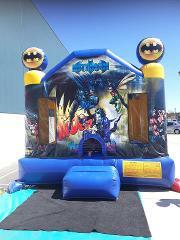 Bring Gotham City to your next special event with our Batman and Joker bouncy castle a.k.a the Bat Cave! What's up doc? Why not have Bugs Bunny, Tweety, Daffy Duck, Tazzie Devil and Sylvester join you for your next special event? 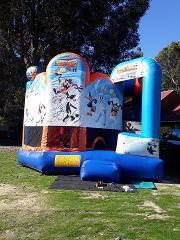 Complete with a slide, hoop, stairs, obstacles and a jumping area, this castle has it all! 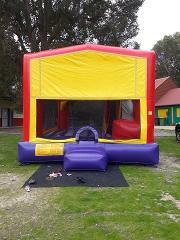 Complete with slide, hoop and jump area, this castle has everything you could possibly need. You can even choose your own banner to go on the front! Pirates, Hawaii or a Happy Birthday banner, it's up to you!